ARM Holdings hopes to steal Intel's dominance of the mobile PC market and have its processors in more than half of all mobile PCs (including tablets and small laptops) sold in 2015. The Cambridge, UK-based company, which licenses its technology as intellectual property rather than manufacturing its own CPUs, is betting that growing consumer interest in portable computers such as tablets will translate into a big jump in its market share. "Today we have about 10 percent market share [in mobile PCs]. By the end of 2011 we believe we will have about 15 percent of that market share as tablets grow," ARM president Tudor Brown said during a news conference at the Computex trade show in Taipei, according to PC World. "By 2015, we expect that to be over 50 percent of the mobile PC market." 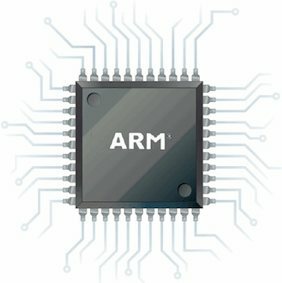 In order to maintain its lead in the tablet market and build on its current success, ARM will have to continue developing more advanced processors. The company's next processor design, the Cortex A15, promises a five-times performance improvement over current smartphone processors while drawing about the same amount of energy, the company said when the design was announced in September 2010. ARM has licensed its latest Cortex A15 patents to several chip vendors, products for which are expected to arrive in late 2011 (first prototypes) and early 2012 (commercial chips). The A15 is currently manufactured using a 32nm or 28nm production process. ARM, which works on chip production technology with IBM, is also planning more advanced chips: the two companies have been testing chips at 20nm for over a year. ARM's partnership with IBM has already been extended to the 14nm mark. Two months ago, Microsoft announced that the next version of Windows will support System on a Chip (SoC) architectures from ARM-based systems designed by partners Nvidia, Qualcomm, and Texas Instruments. While Windows isn't exactly the dominating operating system in mobile, Cambridge definitely needs Redmond if it's going to increase market share in any part of the PC market.